New Feature. Universal search – starting with search top pages. 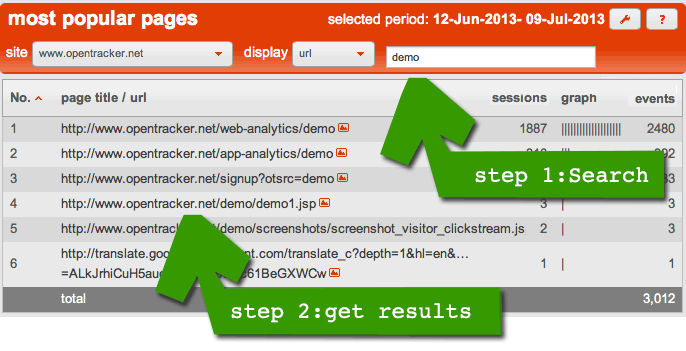 Opentracker users can now see a Search field in the Top Pages report. This is a “universal search,” kind of like a google search, but through Opentracker. This is something that we have been planning for some time, and are now able to build because we have stepped over to an elastic/ distributed data platform. The result? Everything can be searched in an instant. We’ve started with the Top Pages, where you can search on any url. More to follow. What can you actually do with this? For example, if you have a sign-up process, you can enter ‘signup’ and instantly see all urls with ‘signup’ in them, or ‘special’ if you have a Special running, or all pages associated with any product group or name. The next step will be to place the search tool on other pages. The technology has been built, and works. What remains is for us to make it usable. Anybody with an Opentracker account can do this with the api, if they can program or develop. For example, searching on custom events. The second way to find any piece of information is in the reporting interface, where we are building custom filters to make the info accessible. If this sparks an idea for you, please write to us.